On day 2 of Warren’s railroad wrecking expedition, the Union troops were up early. The divisions of Griffin and Ayres north of the Nottoway were aroused at 2 a. m. in order to make sure they reached the Weldon Railroad by the end of the day. Both divisions had crossed the river two and a half hours later. Once this occurred, Warren had his pontoon bridge pulled up to prevent any Confederates from following the column from the direction of the Jerusalem Plank Road. Mott’s Division and the supply trains, already south of the river at the start of the day, slept in a little, first moving at 6:30 and reaching Sussex Court House to the south a few hours later. Gregg’s Cavalry, leading the column, was aroused around 4 a. m., and cautiously probed the road west from Sussex Court House to the Weldon Railroad. Griffin’s infantry, leading Warren’s foot soldiers, left Sussex Court House at daylight. As the sun rose that morning and the day grew warm, many soldiers in the column decided to discard their overcoats and excess clothing. They would soon regret this move. Gregg’s cavalry scattered various Confederate pickets of Hampton’s cavalry corps on the move west, reaching Halifax Road and the neighboring Weldon Railroad around 9 a. m. Hampton’s men had crossed the Nottoway River at Gee’s Ford, and group of 60 men from a Virginia regiment even managed to penetrate between Gregg and the trailing Union infantry before being craven away. When Gregg reached the Weldon Railroad, the Union cavalry split, with Smith’s Brigade heading north and destroying the railroad bridge over the Nottoway River while the other two brigades turned south. After learning the Union forces were moving south down the Weldon Railroad, Hampton pulled his pickets back over the Nottoway. At this point, he learned Lee was sending A. P. Hill with a large infantry force to help intercept Warren’s column. He moved with the rest of his cavalry, following the brigades of Waring and Barringer to Hicksford. Ulysses S. Grant was keeping tabs on incoming reports with great interest. Once he learned that the Confederates were opposing Warren’s raiders, the Union commander wondered, as usual, if Lee had weakened his lines defending Richmond and/or Petersburg. He asked Meade to order a reconnaissance on Lee’s right southwest of the latter city. A small group of cavalry made a probe down the Vaughan Road and ran into Young’s Confederate troopers dug in behind Hatcher’s Run. The report from this recon movement didn’t reach Meade and Grant until late that evening, and it would lead to a larger probe in the same direction the next day. A. P. Hill’s large infantry force started their day in the vicinity of Burgess Mill. They presumably got an early start, and marched south to Dinwiddie Court House, taking the road south of that town four miles, where they camped in the vicinity of Stony Creek that night. They were still out of striking distance of Warren’s column. One more day of marching would put them in the fight. The most important event of the day happened after the sun went down. 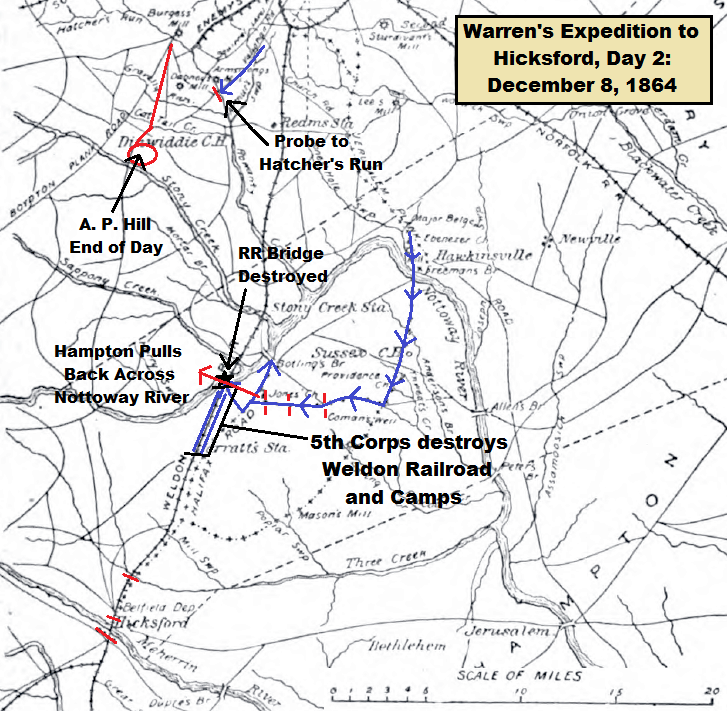 Warren’s infantry had followed Gregg’s cavalry west, the first men of Griffin’s Division reaching the Weldon Railroad at noon. As Warren’s men continued to arrive, they spread out up and down the Weldon Railroad from the Nottoway River south to Jarratt’s Station. The last men were in place by 6 p. m., and they thoroughly wrecked the railroad until midnight, finally bivouacking for the night where they were positioned along the ruined roadbed.